During the vendor’s Sapphire conference in the US, the company unveiled its new-look suite of solutions, which it’s pitching as both integrated and modular capabilities that allow organisations to address and influence the customer journey from beginning to end, leveraging data. The rebranding and repositioning is also designed to reflect the integration of SAP’s core enterprise technologies with those it has acquired over the last five years. The SAP C/4Hana portfolio incorporates: SAP Marketing Cloud; Commerce Cloud, which is based on the Hybris commerce platform acquired in 2013; Service Cloud; Sales Cloud, which leverages the US$2.4 billion acquisition of Callidus Software’s HR, sales performance and quote-to-cash system in January; and the new Customer Data Cloud, created off the back of its 2017 acquisition of customer identity management vendor, Gigya, for US$350 million. These, in turn, connect through to SAP’s core enterprise offerings, such as its S/4HANA ERP platform, as well as take advantage of SAP Leonardo, the vendor’s artificial intelligence play launched in 2017. They’re also integrated with the new HANA Data Management Suite aimed at better management of distributed data sets. HANA is the name of the vendor’s core in-memory database, underpinning its offering. 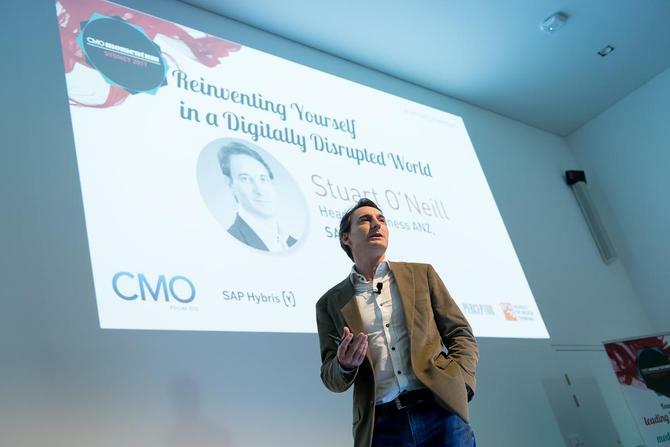 SAP A/NZ GM of customer success, Stuart O’Neill, told CMO the new strategy is designed to showcase how SAP is addressing real-time, front- and back-end customer engagement. “It’s about ensuring we have end-to-end suite of solutions modular enough but closely integrated, that enable us to influence a customer’s journey no matter where they start or finish that journey,” he said. “It also provides the ability to leverage that back-end data existing in an organisation and allow it to be used in real-time by customers. “We have spent many years talking about experience and personalisation. At Sapphire, what our CEO [Alex Atzberger] talked about was it’s time to move away from creepy, and get to in-time personalisation. “Creepy means the emails following you around and the way organisations treat someone likes a sales opportunity rather than as a person. This needs to be replaced with an experience personalised to what customers require and that’s contextually relevant at that point in time. That requires a level of solutions fully integrated with content. Being able to drive that dynamic personalisation by leveraging real content and knowledge means you’re able to influence the customer’s requirements. While the ‘hybris’ name has had its place, this will disappear in favour of a brand suite that more clearly defines the SAP proposition, O’Neill said. It also gives SAP the ability to more directly contrast its offering to that of marketing and experience cloud enterprise competitors such as Salesforce, Adobe and Oracle. In an exclusive interview with CMO in March, Atzberger positioned SAP as one of the few with a truly integrated suite of solutions for the modern enterprise, from digital portal to operational back-end. At the same time, he recognised the vendor had a brand recognition problem. O’Neill also struck out at enterprise competitors, suggesting SAP is one of the few with a highly integrated offering already. “We have been selling these capabilities as SAP for some time; what we’re seeing now is all of our competitors moving in the same direction and finally start to integrate their solutions,” he continued. “What we have done is rebrand and come up with a clearer strategy and roadmap, so our customers can see what we have been doing for the last few years. O’Neill declined to disclose specific tech gaps currently. “As tech changes, there may be a need to address certain areas – which is what we did with Gigya for example in the consent area,” he said. “We are seeing competitors doing something similar. It almost confirms what we have been doing for some time. O’Neill also pointed to Adobe’s acquisition of Magento as overdue recognition that the vendor needed to provide ecommerce management as part of its Experience Cloud offering. “One of the advantages we have over the rest of the market is we are essentially one of the first movers,” O’Neill claimed. “We acquired hybris in 2013, and developed that solution quickly. We already had CRM, and have started investing heavily in building those capabilities to move that from on-premise to cloud. We’ve developed marketing capabilities, tying it in to ensure it’s authenticated at the front-end. We have been doing this for some time. With a lot of the others, they’re really only starting to catch up in building an end-to-end suite, while being strong in some areas. O’Neill agreed this can’t mean SAP focuses exclusively on its own technology, however, and signalled partnerships with integrators and other vendors remain important. He noted the relationship between the HANA database with AWS, Google and Microsoft Azure, as well as between Commerce Cloud with Azure, as examples.